Looking at this picture of me and David as infants today and trying to break down which parts of me and which parts of David have been passed on to William. I think he is truly a mix. Your right! He is a perfect mix!! I miss that little guy! Give him a kiss for me! Wow, Definately a mixture of both of you. I concur...he is a beautiful mix of the two of you! such a mix! he's beautiful liz. I think he has your cute button nose and maybe even your mouth and definitely your mannerisms as exemplified in his and your tilt in your heads but other wise he has David's big round eyes!! Such a love bug you make a great combo baby! I love the curl in your hair! And, William is the perfect mix- so adorable! what a cute trio of photos! a mix but, a tad more momma. Super cute side by side. Wow...I always thought he had your eyes, but I think they are definitely Davids shape. He is such a good mix. Oh, he is so adorable! Nose up he looks like the Dad... nose down he's all you. Great genes in any case! Three cute babies. Very, very cute. 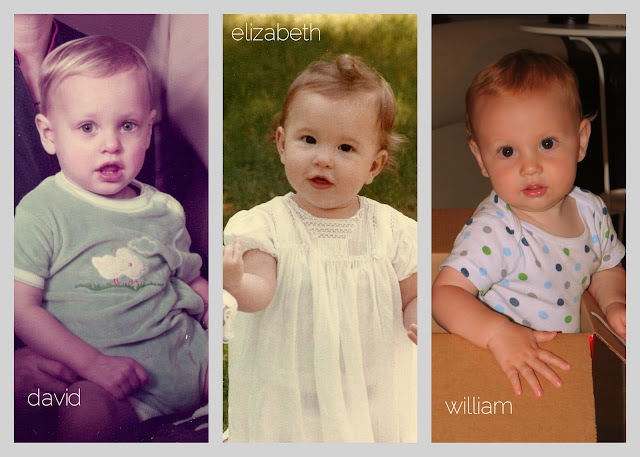 I cannot get enough of William's eyes. They are TO DIE FOR.